The album "Geisterstadt" is a sequel to the demo "Kalt", which described a cold, dangerous but beautiful landscape of stone and ice. In "Geisterstadt" the auditor takes refuge in an old silvermine and the song "In Der Mine" describes the way through the dangerous caves inside of the mountain. The journey continues in a forsaken boom town. Songs 2-6 describe the impressions, such an old mountain town ewokes. 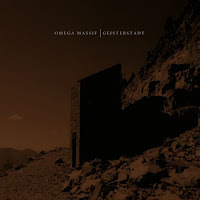 A stunning debut from this German quartet, Geisterstadt ("Ghost Town" in German) weaves a tale of ancient abandoned silver mines, treks through deep mountain tunnels, and forsaken boom towns illustrated through Omega Massif's massive instrumental metal. Slow and brooding, the songs on Geisterstadt bring flurries of soaring melodic guitar lines to elephantine riffage descended from Pelican's Australasia and a dustbowl ambience that sounds like what Earth's Hex mighta sounded like if Dylan Carlson had injected that album with a high level of chugging saurian metalcore. The voiceless nature of the music turns the focus on pure atmosphere, and they deliver it, layering the pulverizing repetitive metalchug with a sense of gloom and longing that becomes near-suffocating at times, but there are also lots of gorgeous ethereal melodies that remind me of Year Of No Light - not too surprising then that this album came out on Radar Swarm, the French label run by Johan from Year Of No Light and home to a host of amazing, arty metalcore/"post-metal" bands like YONL, Spinning Heads, Gantz, and Cortez. Sure, Omega Massif are following fairly closely in the footsteps of bands like Pelican, Year Of No Light and Isis with their debut, but their mix of meditative, epic ambient rock and destructively heaviness is so perfectly rendered that I can't get enough of this album. The last track "Exodus" in particular is a scorcher, shifting between crushing percussive riffage and wobbly Loveless-esque guitar float that ends in a lethal metalcore breakdown. Quite the burly closer. This disc also has some great artwork, the packaging depicting sepia-toned photographs of ghostly abandoned mining towns.